Jannis Kounellis, a titan of arte povera, hardly needs introduction; his show at London’s Parasol Unit, next to the (very good) show of John Kørner at Victoria Miro, spans his career from the 1960s to today. The works cover his formal signatures: steel plate, coal, pulses, dark coats, hair, old wood, wire, steel fixtures, burns, and painting-by-other-means. There are no horses in this show. The work is cool and tough and masculine, but for all its reliance on steel, it is not really Minimal or mono-textural. His delight in materials resonates with the viewer, and these materials, some majestic, others quotidian, are those of the factory, the mine, the plantation, the oil field. Yes there is fabric here also, but it is dark wool, neatly pressed: the austere formality of an undertaker’s blue-black coat. No place here for the colour, delicacy, fragility, in short, femininity, that one sees, and often admires, in an (early) Eva Hesse or Carla Black, or indeed, in a good deal of contemporary materials-based art practice. Lastly, the work is physical and visceral: there are no piles of documentation, no videos, no grainy photographs, and steers clear of conspicuous conceptualism and stays in the firmly aesthetic realm. That is not to say it is lacking in subtlety, or psychological associations: the 2012 cross draped in coats evokes the flaming crosses of Ku Klux Klan rallies (albeit as a negative – black flames on white walls). 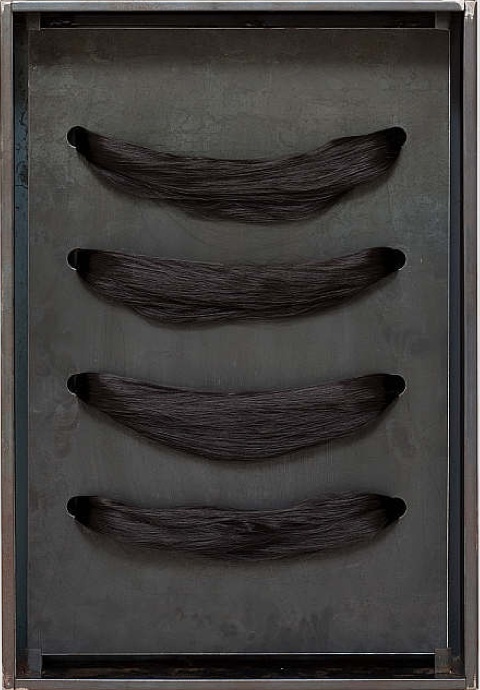 I thought one of my favourite pieces (1969) was a modestly-sized piece of steel with two holes cut through, and human hair hanging out in a braid. This piece, besides the weird, African, shamanistic associations of hair sundered from its body, was somehow haunting: those symmetrical holes cut in the metal, right at (what would be, on a human) the base of the skull, the start of the spinal column, possibly the most primitive part of our brains, site of the most terrifying surgeries. I thought the piece as a whole married the spare elegance of a Fontana slash, with the creepiness of primitive masks, resulting in something that, ironically, is very bodily, like a Hesse or Louise Bourgeois, albeit without the gender overtones. The third work I thought notable was a spiral ramp, in steel, built around a pillar. On this ramp, at shoulder height, a single toy locomotive was placed. This piece, of 1977, was interesting to me because of the ramp itself, its, possibly, threateningly-sharp, edge, like some sort of drill or cutting instrument. It also reminded me of the ramps one finds in old Italian churches and palaces, as well as inter alia the Hagia Sophia, used by horses to go up to higher floors. 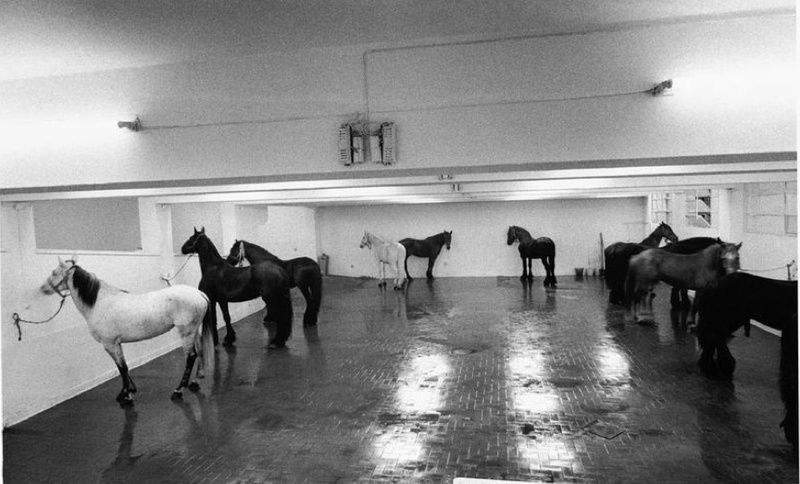 I don’t know if either allusion is intentional, but of course, Kounellis is well-known for his live horse piece in Rome (1967). The works in the show generally force the viewer to slow down, really look, and closely too. 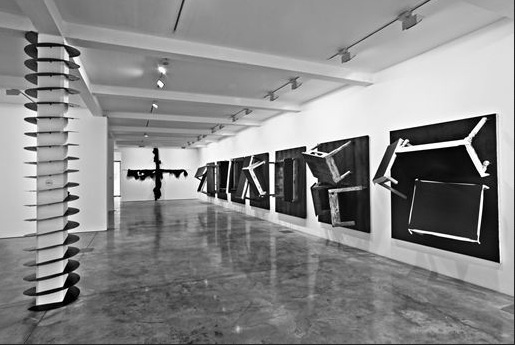 Regardless of whether there is a representational or recollective element (in fact, Kounellis said his aim was to “present, not to represent”), one is faced with the undeniable beauty of the rough, base material. Going out on a limb, I think he takes us back to archaic art, that of Egypt, India, or even certain Byzantine or Romanesque. The aesthetic value of the work is composed in roughly equal parts of: the sculptor’s craft, the materials’ inherent beauty, and the monumentality of the completed work. As such I’d say his work, while using similar materials, falls in a meaningfully different place than many of his Arte Povera peers.